When snows melt and the grasses and daffodils push up through the softened ground of New Jersey's Skylands, it's time to think trout. For many outdoors folks, thawing snow signals the beginning of trout season. Sorting and cleaning tackle and shopping to replace items gone missing last season, all serve to build anticipation. 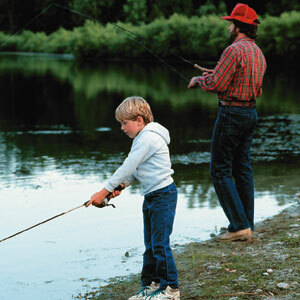 Spring is also the best time to introduce children or grandchildren to trout fishing. While most adults have acquired the patience to fish lakes and streams for trout that may take all day to catch, children are happier when action comes faster. And New Jersey has trout stocking programs that make trout fishing exciting for kids. Early in April the State of New Jersey's Fish and Wildlife division begins augmenting trout populations with regular stocking of hatchery grown fish. In some streams and lakes these are net stocked (scooped out a tank truck and lowered to the water using hand nets) and float stocked (dispersed around the lake by boat). In other places tank trucks are simply driven to the shoreline where trout are dumped into the lake or stream. These stockings often leave fish circulating close to the place in which they are put. In some cases the fish are dumped at convenient boat launch ramps or near docks or bridges. This improves the odds of catching trout in places that are easily accessible and kid-friendly. A little research will help guide you to waters stocked with trout and tell you when the stockings take place. The New Jersey Division of Fish and Wildlife website posts stocking dates during the trout season. The site also carries a host of other fishing news and information. Fishing enthusiasts can even purchase licenses on line. Licenses are required between the ages of sixteen and sixty-nine. Children under the age of sixteen and senior citizens over age sixty-nine fish for free. Trout fishing requires an additional "trout stamp" with the license. You can also refer to the site for a complete recital of rules and regulations. Stocking consists mostly of brown and brook trout, although other species of trout, such as rainbow, lake trout, and other more exotic types are found in some waters. For kids the best introduction to trout fishing happens from an environment that allows them to focus on the fish and catching them. So fishing from a dock or pleasant shoreline is preferred. Rougher surroundings with more difficult access can be frustrating to kids when casting into trees or getting snagged on rocks or submerged tree parts can result in lost hooks, bait, lures and time. Early season trout fishing often bring wide variations in weather; so bring clothing that covers the weather gamut. 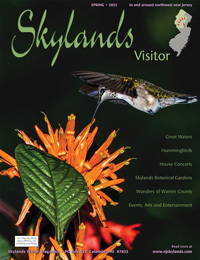 A sunny afternoon in early April in the Skylands can easily turn to a passing snow squall or shower. 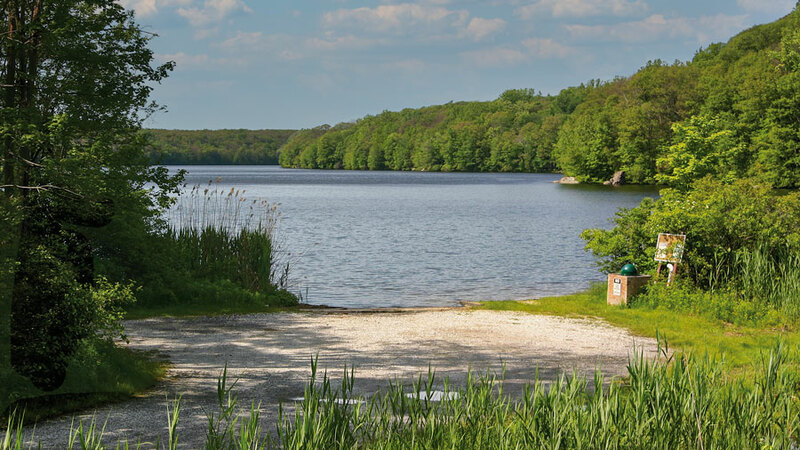 New Jersey has many accessible trout fishing waters ranging from great impoundments like Lake Hopatcong to slim mountain creeks like Dunnfield. In the northern part of the region some fertile post-stocking spots include Monksville Reservoir, Shepard's Lake and Ringwood Brook in Ringwood. At Monksville Reservoir, trout are typically stocked at one of the two boat launches, both of which provide easy access for children. The fish are numerous enough to be visible swimming around the stocking area. Sussex County's Big Flatbrook in High Point State Park has long been a favorite for all ages. Sawmill Lake, which feeds the Flatbrook is another stocked option. In Wawayanda State Park, Wawayanda Lake is also stocked regularly in a few locations, including the boat launch, which is especially pleasant for kids. Further south try Round Valley Reservoir and Spruce Run Reservoir and it's feeder, Spruce Run Creek. The nearby Ken Lockwood Gorge (Raritan River) tends to be overrun with fishermen with more difficult access and special trout rules and is therefore less adapted to kids. Try the Black River, just to the north in Hacklebarney State Park for some fine creek fishing. Dedicated trout fishing hobbyists add extra spots to their menu by applying for a special permit to fish selected waters of the Newark Watershed properties. Owned by the City of Newark, the 35,000-acre natural resource is managed by the Newark Watershed Conservation and Development Corporation. These pristine lands and waters offer a variety of delightful fishing venues that include four reservoirs, Canistear, Clinton, Oakridge andEcho Lake. All are within less than 20 minutes drive of each other along or near route 23. Of the four lakes, Clinton and Canistear show up on recent yearly trout stocking lists. Because the Watershed properties are primary source of drinking water access is tightly controlled. Permit rules and fishing laws are strictly and frequently enforced. Fishing from shore is permitted in some areas, as is rowboat access. Permits can be obtained by application to one of two Watershed offices, Echo Lake, at 223 Echo Lake Road (PO Box 319), Newfoundland, New Jersey 07435, (973) 697-2850, 8:00 am to 3:00 PM or 40 Clinton Street, 4th Floor, Newark, New Jersey 07102, (973) 622-4521. Stocking is mostly done on weekdays, so plan on taking off afternoons to fish with kids. As the days get longer, it's possible to get in three to four hours of fishing time before dark. That is if you don't catch your limit first. Trout limits vary during the season and within given areas so be sure to check the fishing digest published by the State of New Jersey's Fish and Wildlife division before fishing a particular spot. Rangers or fish and wildlife wardens in the given park or area can also provide specific information. If giving children a pleasant fishing experience requires selecting the right fishing venue, it also requires the right gear. Here too it is best to keep things simple. A closed face fishing reel on a simple bait casting rod will do. Avoid toy-like toddler starter packs (usually made in fluorescent colors meant to attract kids). They tend to break easily. Instead try for a functional rod and a closed-face reel combination oriented more toward the youth market. These are less flashy looking and a little more money, but should provide years of usability. For most trout fishing the line need not be greater than six-pound test. Trout are especially sensitive to line they can "see". Thicker line can make them shy way from bait or lures. The closed-face reel minimizes tangles for maximum fishing time. While most children are interested in the constant cast and retrieve action provided by fishing with lures, the complexities of this type of fishing are more suited to kids with a few years experience. Freshly stocked areas are often fished by a handful of anglers, so children need to co-exist with others that may be maneuvering their lures through the same area. This leaves bait fishing and the question of bait. Recently stocked trout seem uninterested in the standard earthworm or night crawler, preferring instead mealworms or live minnows. Adults and more advanced fisherkids who may have experience with fly fishing will find stocked trout fairly responsive to a number of nymphs and wet flies. Another advantage of fishing a newly stocked environment is that competition is less apparent. With hundreds of gullible hatchery fish available other anglers are more willing to share tips on what bait is working. So don't be bashful, ask! Remember that some fishing spots put children right next to deep cold water. Close adult monitoring and supervision is a must. Small children fishing from docks should wear a personal floatation device (PFD) as they would when fishing from a boat. Be sure the PFD is a children's fit model. Fishing hooks, bait and the fish themselves expose children to sources of possible infection. Pre-existing open cuts or abrasions should be kept protected from exposure. Mishaps that occur during fishing outings should also be treated and monitored to prevent infection. This is where a first aid kit tucked into the car can come in handy. Sometimes, when the fish are plentiful and fish are biting, anglers overlook these details. The focus, of course, is on catching fish. Although the concept of catch and release seems to gain an increased following each year, for many, cooking and eating trout is part of the pleasure of fishing. New Jersey stocks fish that are perfect pan-size specimens. The fish should be cleaned as quickly as possible. This prevents the innards from imparting any unpleasant taste or smell to the fish. Although children should be introduced to the methods of cleaning the fish, the use of sharp knives on a slippery fish is best left to adults. Cleaned fish should be placed in refrigeration as quickly as possible. One way to keep them cool in the field is the creel. Old-fashioned bamboo creels can still be found. These should be dipped in the water and have the bottom lined with a few ferns (usually found growing along streams) or sweet grass. The wet bamboo provides convection cooling, while the ferns keep the fish from gluing themselves to the creel bottom. Convection is the principle behind a modern fish storage bag called the Arcti-Creel. Woven into a flax-like canvas this creel's material, should also be soaked first by dipping into the water, acts as a convection-cooling bag. The inside of this creel is plastic and is also best lined with fern fronds. Once at home, the fish can be rinsed again, drained and stored on a covered plate. Trout are easy to prepare for eating and invite a variety of techniques, different from preparation of other fish. Breading, coating with flour and other such mundane fish standbys are out. These are too heavy handed for trout, a fish that begs a more delicate touch. Try stuffing the bellies of the fish with sprigs of fresh dill weed, sprinkle with salt and pepper and sautéing them in butter. Cover the pan after one side is browned and the fish is flipped. Serve with a squeeze of lemon. Or stuff the fish with a few large sage leaves using the same sauté technique. For a more luxurious flavor, fry the fish in butter adding cognac or Cointreau orange liqueur after initial browning. The health conscious might prefer trout poached in lemon juice or white wine. Again, a few sprigs of light herbs and a dash of salt and pepper are all that is needed. Some of these seasoning techniques can also be applied to trout wrapped in foil and baked in the oven or on the outdoor grill, for convenience. When it's time to eat the trout, a little guidance in boning the fish helps. Pluck the dorsal and pectoral fins away first. Use a fork to comb the meat up and away from the bones, starting at the dorsal (top of back) line and lifting progressively. Then pull the center skeleton gently away from the second half of the fish. The result should be two relatively bone free delicious fillets. Children should be reminded to watch for the thin bones as they eat. Beyond just fishing, children find participation in the cooking process exciting. A hands-on catch-to-pan-to-mouth experience can result in a child just as hooked on spring trout fishing as any adult - a great way to break into springtime in New Jersey. Visit the NJ Division of Fish, Game and Wildlife for current license fees and regulations. And don't forget that April 9th is the opening day for trout season in 2016.